The forerunner of the Jungheinrich Group was established by Hermann Jungheinrich in 1908 as an import and export firm under the name H. Jungheinrich & Co. In 1953 his eldest son, Friedrich Jungheinrich, laid the cornerstone for the present company by establishing H. Jungheinrich and Co. Maschinenfabrik. After the passing away of the founder, Jungheinrich remains an independent family business owned by the shareholder families Lange and Wolf. In the year of German reunification Jungheinrich goes public. Jungheinrich responds to the pent-up demand for modern industrial trucks and warehouse equipment in the new German states and the former Eastern Bloc countries. Jungheinrich acquires the Boss Group, including long-standing Steinbock company in Moosburg, Bavaria. In 1990 the company undergoes comprehensive restructuring. At the turn of the millennium Jungheinrich offers their products exclusively under the Jungheinrich brand. The Complete Intralogistics Solutions, Financial Services and Full Service divisions are continuously expanded. In parallel Jungheinrich strengthen their sales units and position themselves on the globalised markets. As we already mentioned the Jungheinrich Group is the third largest material handling equipment company in the world and the second largest in Europe. The headquarters of the Jungheinrich Group is in Hamburg, Germany. Most of their engine-powered material handling equipment is manufactured in five factories in Germany. A selection of low-lift trucks, stacker trucks, battery-powered counterbalanced trucks and reach trucks is produced for the Asian market in Qingpu (China). Moreover, used equipment is industrially reconditioned for the European market in a dedicated facility near Dresden. The 18.0 million ordinary shares in Jungheinrich AG are held by the families of the two daughters of the company’s founder, Dr. Friedrich Jungheinrich, at a ratio of 50:50. The total of 16.0 million non-voting preferred shares are widely held. 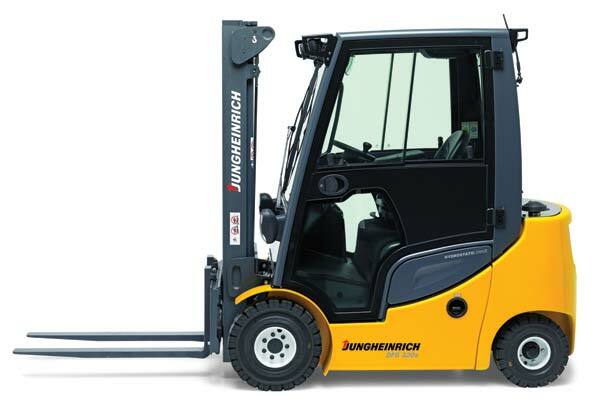 As we just mentioned the Jungheinrich Group is in the business of material handling equipment. In this market Jungheinrich is one of the three biggest players in the world. For those of you who are not familiar with this business, here comes some brief information about it. Material handling equipment is generally separated into four main categories: storage and handling equipment, engineered systems, industrial trucks, and bulk material handling. The equipment that falls under this description is usually non-automated storage equipment. Products such as pallet racking, shelving, casters and carts, among others, belong to storage and handling. Many of these products are often referred to as “catalog” items because they generally have globally accepted standards and are often sold as stock materials out of Material handling catalogs. The following graphic is a demo of a fully equipped warehouse. Engineered systems are typically custom engineered material-handling systems. Conveyors, Handling Robots, AS/RS, AGV and most other automated material-handling systems fall into this category. Engineered systems are often a combination of products integrated into one system. Many distribution centers will optimize storage and picking by utilizing engineered systems such as pick modules and sortition systems. Industrial trucks usually refer to operator driven motorized warehouse vehicles, powered manually, by gasoline, propane or electrically. Industrial trucks assist the material-handling system with versatility; they can go where engineered systems cannot. Forklift trucks are the most common example of industrial trucks but certainly aren’t the extent of the category. Tow tractors and stock chasers are additional examples of industrial trucks. Bulk material-handling equipment is used to move and store bulk materials such as ore, liquids, and cereals. 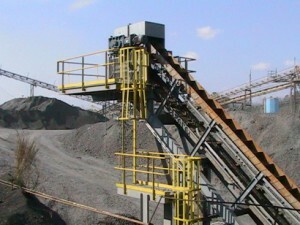 This equipment is often seen on farms, mines, shipyards and refineries. This is normally a low margin business with a fierce competition in the market. The Jungheinrich Group manufactures and sells products in the first three categories. So, who are the competitors of the Jungheinrich Group? If you have a look at the World Ranking of Forklift-Trucks you can see that there are 32 companies who have a revenue in the amount of 10 million Euro and more. World wide Jungheinrich is at the third place, behind the leader Toyota and the Kion Group. You can see at the first bar chart, that Toyota has revenues in the sector of material handling more than twice as high as Jungheinrich. The German company Kion Group AG, with the sub-brands Linde, Still, OM, Baoli, Fenwick and Voltas has an annual revenue in the amount of 6.11 billion dollars. 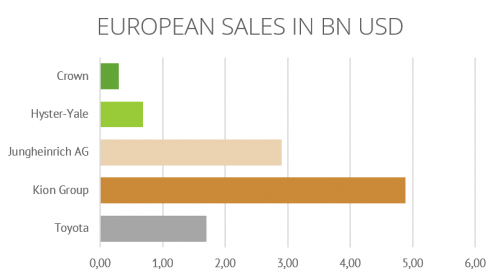 If you have a look at the second bar chart you can see that the European market is different. For the Kion and the Jungheinrich Group the European market is the main market. The Kion and the Jungheinrich Group generate about eighty per cent of their revenues in Europe. Toyota generates just one-quarter of their revenues in Europe and the other ones even less. So the European market gets dominated by Kion, Jungheinrich and at certain levels of Toyota. Following substantial uncertainty and fears about the Eurozone’s survival and potential global recessionary tendencies in 2012, the market for material handling equipment posted tangible growth in the year 2013, against the backdrop of the recovery of the world economy. In 2013 global market volume actually surpassed the one million truck mark for the first time. Major growth stimuli were injected by China, North America and Eastern Europe. Europe continues to be Jungheinrich’s main sales market, but Asia has become the world’s largest material handling equipment market, making it increasingly important for players in the sector including Jungheinrich. However, the North American market also recorded a strong rise in volume. 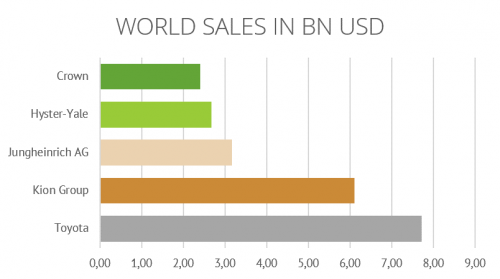 In the first six months of 2014 the world market has increased by 10 per cent. You could observe the same trend at the European market. How inefficient the Chinese logistic business is at the moment, you can see at the following numbers. China has over 700,000 trucking operators, most of them one-man outfits. (America has about 7,000.) Scale is essential to the business, but the top 20 firms together make up barely 2% of the market. Nancy Qian of KXTX, a logistics firm, observes that companies compete so fiercely on price that most barely make any money, and so lack the funds needed to modernise or achieve economies of scale. The good news is that moves are afoot to improve the industry. The central government is concerned about its inefficiency and cost. At a meeting last month of the State Council, China’s cabinet, leaders approved a new plan for reform, though details are still being finalised. The goal is to lower costs and develop larger companies. In summary it can be stated that China has much potential in this area. Jungheinrich is focused on expanding its sales operations in the Asia-Pacific, Eastern Europe and America’ s growth regions in order to increase its share of these markets. 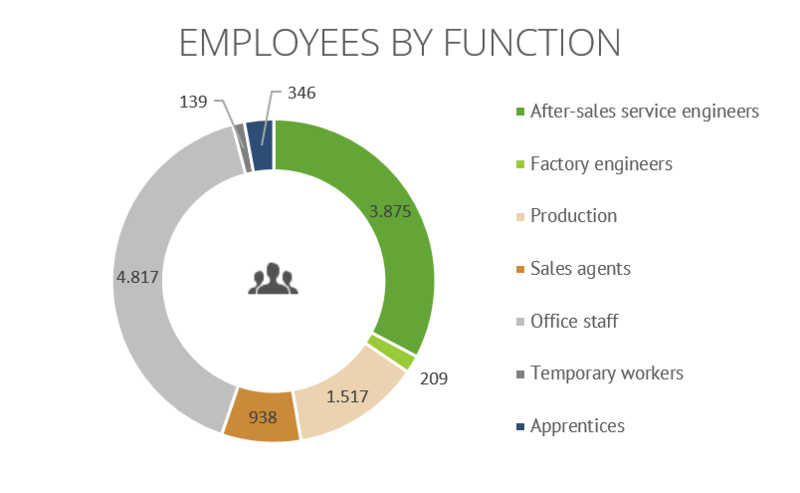 According to this they recruited new sales staff in these regions last year (increased to 600 in Asia) and built a new factory in Qingpu (China). The total costs of the new factory in China were about 18 million Euro. It has the capacity to produce more than 10,000 pieces of material handling equipment per year. In the next chart you see the footprint of employment at the Jungheinrich AG. 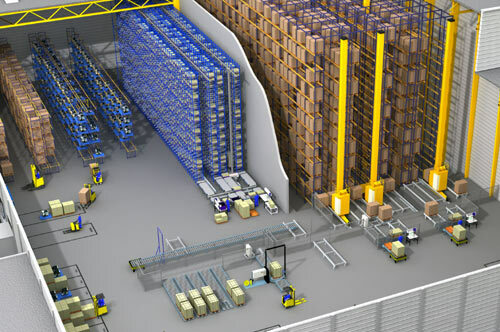 The main trend in this business is the development of customised automated solutions for warehouses. Industrial Truck Association President, Jeff Rufener, predicted that by 2025 fully automated and guided vehicles will account for 50% of industrial truck sales. Based in Pittsburgh, PA, Seegrid flexible automated guided vehicles (AGVs), the cutting edge robotic industry truck leader, has seen a 350% increase in sales since 2012 and an 1860% increase in lead generation. Clearly, this area is a key position for the companies in the material handling business. In Europe Jungheinrich is the market leader in warehouse technique. Another trend you can observe is that the customers want more and more a complete solution from one source. This means that from goods-receipt over the warehouse logistic, including the whole management by modern, efficient software, to the goods issue is planned and produced by one provider. For this reason Jungheinrich expended exactly this area of logistic system business, which encompasses the planning, project engineering and implementation of complete warehouses. The company pursues a strategy that sets it apart from the competition in the material handling equipment business. Going beyond Europe as the point of focus, centres of excellence have been planned in Asia and Russia in this field. Jungheinrich made major progress in 2013. A significant step was the acquisition of the remaining 75 per cent of the shares in Jungheinrich Systemlösungen GmbH (formerly ISA – Innovative Systemlösungen für die Automation GmbH) based in Graz (Austria) as of January 1, 2013. Among the company’s offerings are software for integrated, holistic material flow and warehouse logistics solutions as well as associated services such as project planning, implementation, training and service. Other future trends are on the one hand the reducing of energy consumption and on the other hand the decrease of the total cost of ownership of a forklift truck. Here we have a business-to-business concept. The Jungheinrich Group’s operating activities are divided between the “Intralogistics” and “Financial Services” segments. The “Intralogistics” segment encompasses the following business fields: – New truck business: development, production and sale of new trucks including logistics systems as well as the mail-order business; – Short-term hire: rental of new and used material handling equipment; – Used equipment: reconditioning and sale of used equipment and – After-sales services: the maintenance, repair and spare parts businesses. Activities undertaken by the ‘Financial Services’ segment encompass the usage transfer and sales financing of material handling equipment and warehousing technology products. Financial Services support the operating sales units in accordance with Jungheinrich’s business model. The ‘Financial Services’ segment finances itself autonomously. 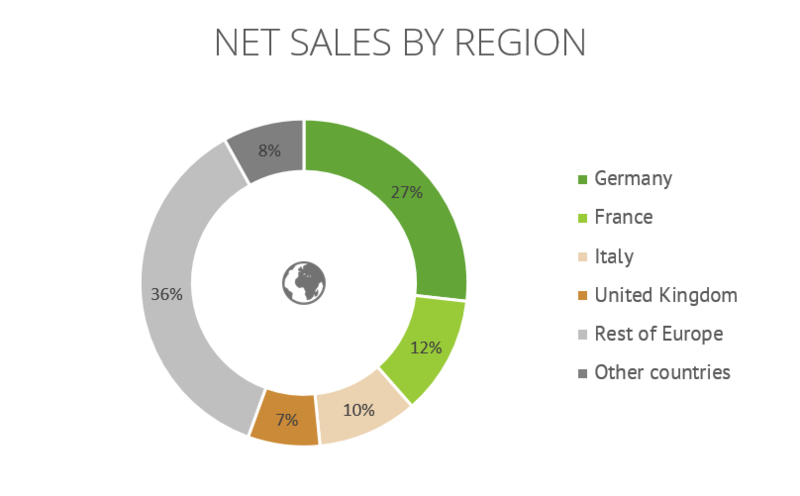 In the next graph you can observe the distribution of net sales of Jungheinrich. Strictly speaking, all these areas are related. It starts with the new truck business. All products of the Jungheinrich Group are sold directly and under one brand. 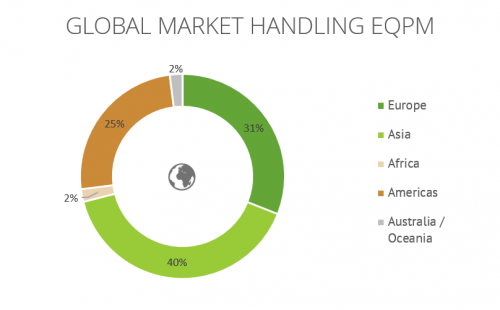 So we are dealing with a single-brand strategy focussing on products and services in the premium segment of the global material handling equipment market. Furthermore Jungheinrich operates an efficient, global direct sales and service network with its own sales centres and branch offices in Germany and proprietary sales and service companies in the rest of Europe and the world. In addition, Jungheinrich products are distributed via local dealers—primarily overseas. In North America, Jungheinrich relies on its strong sales partner Mitsubishi Caterpillar Forklift America Inc. (MCFA), which has a large dealership footprint. Its operations are completed by a catalogue-based mail-order business, which is run as an online store. Jungheinrich’s business model is designed to serve customers from a single source over a product’s entire life cycle. So, after selling a product the maintenance, repair and spare parts business begins. This business is the one with the highest margin, as we heard from the investor relations and employees. Unfortunately they do not disclose exact margins. But we estimate that the EBIT margin in the after sales services is roundabout 20 -25 percent. Due to our research, this is a conservative approach for after sales services markets. For some customers it has more advantages not to buy a new product. And here Jungheinrich provides the service of short-term hire. Here, Jungheinrich has the second highest margin. Today, every second incoming truck in the used equipment centre in Dresden either stems from an expired financial service agreement or a terminated short-term hire arrangement. Jungheinrich satisfies demand for used equipment in Europe, Asia and South America in form from hiring and selling those products. Finally, the Financial Services enable a complete solution from a single source. As a one-stop-shop for intralogistics, Jungheinrich offers its customers manufacturer-direct tailor- made financial services. This gives customers just one point of contact—be it for forklifts, financing or service. As we already mentioned, Jungheinrich doesn’t disclose exact EBIT-margins of the individual sub-segments. 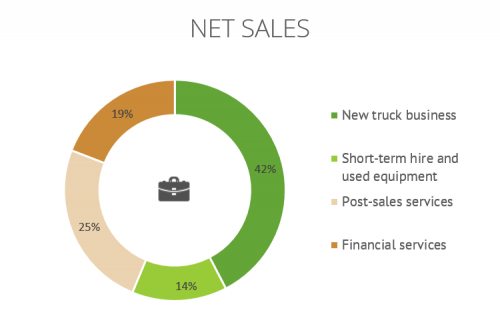 But the information we got was that the highest margin is generated by the after-sales-services, followed by short-term-hire and used equipment and the financial services. The new truck business is so tight that sometimes they cannot generate any margin in this business. As we have already read in the investor letter of RV Capital a Financial Services arm of a company like BMW can add a lot of value to the overall value of a company. But at that point in time we are not sure how to evaluate the financial services of Jungheinrich due to the fact that this is clearly no small consumer financing business and we cannot estimate how prudent the company is by giving out financing. Does Jungheinrich have a moat? The material handling equipment market is characterised by fierce competition and increasing consolidation tendencies, but nevertheless we would say that Jungheinrich has a moat in some segments. To justify this, here comes an example. As a consequence of the direct sales, the service network Jungheinrich is very close to the wishes and needs of their customers. So they developed together with the German food retailer ALDI a special pallet truck. What makes this truck special? You can drive this truck sideways. So you can see where you drive, even if the truck is highly loaded with pallets. 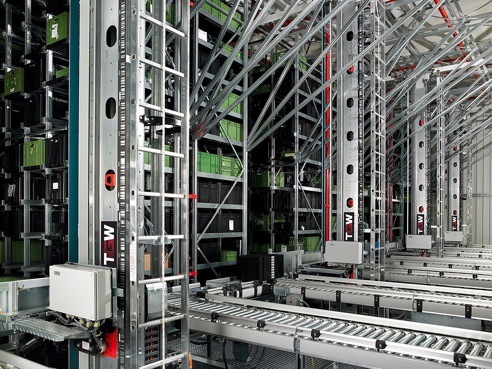 Another example is a lift for warehouse systems which you can drive out of the shelves and replace it manually which is a really good think when it is broken. Now you can say, that is not a big thing to develop a truck like this. Certainly it is not. But if you have regular contact with your customer, you learn a lot of their needs and you can easily find solutions for them. The consequence was that now the other food retailer like LIDL, NETTO etc. use this truck (ESE 110) too. The KION Group for example uses a direct sales and service network as well, but not in the same extent. So, we think that the point just mentioned and the single-brand strategy is a strong unique selling proposition (USP). Furthermore we really like the costumer orientated approach of companies like Rational and Jungheinrich. Also the fact that Jungheinrich is a traditional, family owned company with a long history is perceived as a plus, as employees told us. So Jungheinrich profits from an equally good costumer relation as it does our previous example STO AG. When you have decided, perhaps from one of the above reasons, for a Jungheinrich fork-lift or a complete warehouse solution, there is something like a lock-in effect. The lock-in effect refers to the maintenance, repair and spare parts business. Usually Jungheinrich has contracts for the entire life cycle of the product. But this has not only advantages for Jungheinrich. The regular expectations (one to two times a year) cut the expensive downtimes for the owners. Furthermore Jungheinrich gives a guarantee to the users that the can repair everything in less than 24 hours which requires a really good service and distribution system which other competitors in europe cannot match at the moment. All in all we think that this extensive business model does not have a moat in the new truck business. Here is the competition definitely to strong and the margins to low. In the area of complete warehouse solutions and fully automatic systems Jungheinrich is the market leader in the world. This is the most promising areas in the future. But we think there is a moat in the after-sales services, fully automatic systems and the overall huge cost of potential down-times of a storage system. This also explain the huge customer retention rate after the contracts end, after some interviews we think this should be over 80%, If you have a look from the outside, you can see that in the European market there are just two or maybe three large companies who compete in all areas. If it were easy to compete in this areas, there would be more competitors of the same size. Obviously, this is a sign for a moat at least in some segments. If we apply the M-Score it should be around 6-7 in the storage system segment. The Jungheinrich Group is exposed to general risks arising, above all from the development of the world economy. Cyclical fluctuations subject the business trend to risks above all in key European markets. Furthermore, the risk of losing market share has to be mitigated by the company by constantly expanding its product range and service offering as well as further increasing its sales workforce, providing attractive financing solutions, and further intensifying its differentiation strategy, for example by expanding the logistics systems business. Another risk is the labor market. Above all, the German labor market, because here are most of the plants of the Jungheinrich Group. Jungheinrich has ambitious growth targets and to realise them they need skilled workers such as electrical engineers, salespeople and engineers. But it is getting harder to find such qualified staff in Germany. Furthermore the strong growth focus can lead to some problems in the future, but due to the fact that Jungheinrich has no strong leverage the overall risks are relatively low. Finally, there is the dependence on the overall steel industry and the steel price. So, what do we think is a fair price for the Jungheinrich share? And what are we willing to pay? Unfortunately, there are many indicators which tell us that the Jungheinrich share is at the moment fairly priced. This means for us that there is no margin of safety at the present price. For example we calculated the Price-to-Book-Ratio of about 1.7 (share price approx. 43 Euro). We got a ROIC of 11.43 per cent for the year 2013 and consequently a ROIC in relation to the share price of 6.43 per cent. For a buying decision we want to have a ROIC in relation to the share price of at least 12 per cent. It corresponds to our margin of safety and our idea of the rate of return on our capital employed. As you can see in the following graph the ROIC of Jungheinrich has increased continuously over the last years and this despite the ramped up investment into growth CAPEX and an increase in tangible assets. We also calculated the Earnings-Power-Value without any further growth according to Bruce Greenwald with 40.73 Euro which is under the purchase price of today. As an Value investor we would like to have a N-EPV of more than the purchase price and receive the growth for free. But all these results are not very surprising due to the fact that at this moment most of the shares from companies of this size and with this market position are expensive. From the investor relations we heard of the following growth target. In the year of 2020 the Jungheinrich Group plans to have revenues in the amount of 4 billion Euro. This is a CAGR of approx. 8.1 per cent, based on revenues of 2.3 billion Euro in 2013. 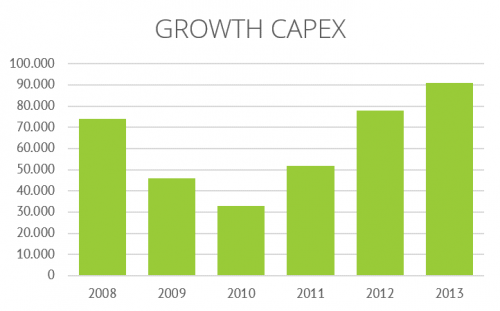 This growth targets can be seen in the growth CAPEX of the last 4 years. It has almost tripled up to 91 million a year. Maybe for those of you who are willing to pay for growth the share is not uninteresting, even at this price. Considering the fact that at the beginning of the year the stock was trading at 57 Euro, now is probably a good moment to buy. For us the fair share price with growth over the next five years should be around 58 Euro assumed that the premium we are paying at the moment remains constant over time, otherwise the fair share price should be around 52 Euro without any premium. What also should not go unmentioned is the high equity ratio. Jungheinrich has an equity ratio which—excluding the ‘Financial Services’ segment—amounts to 47 per cent, what is an exemplary figure for the mechanical engineering sector. The Kion Group has an equity ratio of 26.7 per cent and Toyota one of 34.4 per cent. Additionally the dividend yield in 2013 and 2012 was 1.8 percent and 2.9 per cent respectively. We think that Jungheinrich is an interesting investment with regard to the management and the products of the company. Jungheinrich is the market leader in the important areas of complete warehouse solutions and fully automatic systems. Also the fact that Jungheinrich is a traditional family owned company with a long history is a convincing point for us. This is also reflected in the 18 million ordinary shares which are held by the families of the two daughters of the company’s founder. A thing we also like is the single-brand strategy focusing on products and services in the premium segment of the global material handling equipment market and the global direct sales and service network with its own sales centers and branch offices in Germany and proprietary sales and service companies in the rest of Europe and the world. Unfortunately the price of the share at the moment is in our point of view fairly valued or even too high. But as always we have patience and wait for our chance for a cheap purchase. So the Stock is for our watch list and we will assume an investment when the stock trades under 34 Euro so that we get our 12% return and the margin of safety. Disclosure: At the time of publication, no positions in any of the stocks mentioned. Thank you for a good sum up of a very interesting business. 1. 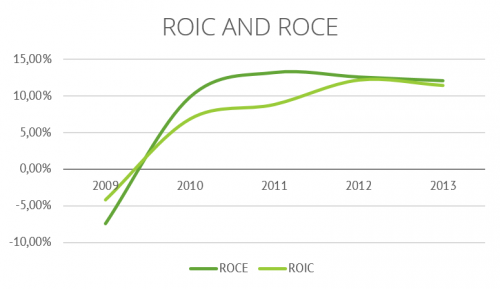 What’s your calculation of ROIC and ROCE, and how are those 2 differ in your eyes? 2. What did you mean by “ROIC in relation to the share price”? 1. We have an own definition of ROIC with which we try to calculate the real return on Investment, if you build everything from scratch. It is based on a bears and stearn paper but its an own approach, so we give not out our exact calculation method. But if you like, you can send me a mail and I will send you the paper and some hints. The calculation of the ROCE is the classic calculation (EBIT/(total assets-short term liabilities-active tax accruals- pension liabilities- other accruals). The difference is that we do not consider the percentage of cash use and depreciated assets under the ROCE but normally, if you don’t have a nuclear power plant, the two should be quite similar. 2. The relation of ROIC to share price is actually the Price/Book to ROIC, if we have a ROIC of 12% and we don’t require a margin of safety we would buy the business if it trades for a P/B of lower or equal to 1 (net cash adjusted). thanks for the analysis, especially regarding the business, which in many aspects I like and agree about it. When I looked at Jungheinrich in August / begin of September my conclusion was that a fair PE for a company with 10% growth and about 13% return on equity is at least 15. At a price of 45-47 Euro, this means a Margin of Safety of 20-25% and a Price Target of 53 Euro (low case) to 60 Euro (high case) within 12-18 months. So as you can see, I think you are to conservative here. P.S. Also long Rational and recently exited STO Vz, below the link to my analysis of Jungheinrich. thanks for the Link and interesting analysis. We always try to evaluate the value of growth and when we use our cost of capital the growth of Jungheinrich doesn’t add a lot of value to the overall company. Furthermore we don’t like that they blow up their EBIT and with this their ROCE by adding the returns of the leasing business and subtract the leasing capital at the calculation of the ROCE. This says something about the incentives of the management which are not necessarily in line with the goals of a long term shareholder. And as we only run a portfolio of 10-12 stocks and require a return of 12% (with a margin of safety of 40-50%) on our money, we have to be really conservative. Thanks for the explanation, I think you are much more strict in the way you define your eligible stocks than me. But we also share some beliefs. Covacoro is short for my strategy: COncentration – VAlue -COntrarian – ROtation. In short owning a Portfolio with 10-12 value stocks, preferably small and mid caps and being ready to take contrarian positions and to regularly rebalance or rotate some positions regarding sector, country etc. to out of favor things.